The Trane family of refrigerant monitors offers two important benefits: refrigerant conservation and safety. The Trane family of refrigerant monitors offers two important benefits: refrigerant conservation and safety. With the decreasing availability of refrigerants, coupled with rising cost, it is important to have a refrigerant monitor in the equipment room to provide early warning of refrigerant loss. As a leak-sensing device, a Trane refrigerant monitor constantly measures the amount of specific refrigerants in the surrounding air. It's capable of initiating alarms, activating building ventilating systems, and integrating with Building Automation Systems. 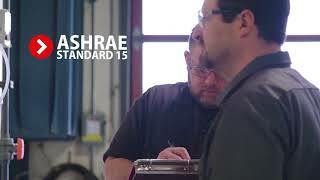 ASHRAE Standard 15 – 2001 requires refrigerant monitors in all new chiller installations and all chiller retrofits. Refrigerant monitors are also strongly recommended for all existing chiller rooms or refrigerant storage facilities. Trane offers two types of refrigerant monitors: RMWH, the newest and most sensitive monitor on the market and RMWG, the most flexible and dependable monitor on the market.